Left to right: WSLHD Mental Health Services executive director A/Prof Beth Kotze with WSLHD Youth Council representative Stephanie D’Souza. In an Australian first, an innovative new program will be piloted in Western Sydney to test how wearable e-health devices can improve the lives of young people with severe mental illness. If proven successful, new technology developed by the unwired Project could revolutionise the care for young people living with severe mental health disorders across Australia. The initiative is aiming to address the alarming mental health statistics for young people in Australia, where suicide is the leading cause of death for 15-24-year olds. “The unWired Project has the potential to transform lives,” Associate Prof Beth Kotze, Executive Director Mental Health Services for Western Sydney Local Health District said. 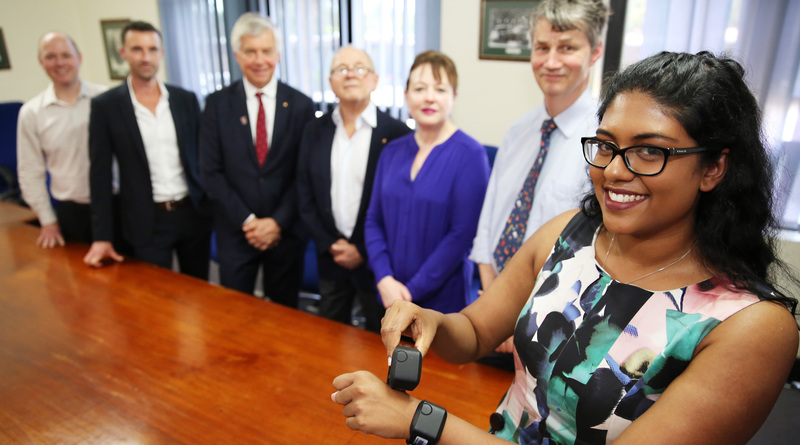 Youth Council representative Stephanie D’Souza shows the device with (right to left) Prof Anthony Harris from the Westmead Clinical School, WSLHD mental health director A/Prof Beth Kotze, Neil Balnaves, WSLHD board chair Richard Alcock, Balnaves Foundation trustee Brad McIntosh and Balnaves Foundation CEO Hamish Balnaves CEO. Clinicians and researchers from Western Sydney Local Health District will manage the unWired Project across its three-year lifespan with significant financial support from The Balnaves Foundation. Personal wearable e-health devices, just like a FitBit, will measure the participant’s activity and give them valuable feedback on their level of stress. With the young person’s consent, data will be sent back to the wearer and their treating clinician via a purpose-built app. This early warning will give the young person the possibility to manage their stress and its impact on their illness and, if necessary, give clinicians an opportunity to intervene early with support before things potentially deteriorate. Twenty young people will take part in the pilot study early next year and it is then expected to go to a full randomised controlled trial involving 80 participants. Left to right: A/Prof Anthony Harris from the Westmead Clinical School, WSLHD youth council member Stephanie D’Souza and WSLHD mental health services executive director A/Prof Beth Kotze. At this stage, all trial participants will be patients of the Prevention Early Intervention and Recovery Service – the WSLHD Youth Mental Health Service based in Parramatta. Associate Prof Kotze says the unWired Project is a great example of what strong public and private partnerships can do. “The Balnaves Foundation has made this project possible and we are very optimistic it can improve the lives of young people in Western Sydney who are living with mental illness,” Prof Kotze said. Hamish Balnaves, CEO of The Balnaves Foundation said the organisation hoped the technology will prevent youth suicide. “We hope that this device can prevent young people from getting to the point where they feel like suicide is their only option,” Hamish Balnaves, CEO of The Balnaves Foundation said. A/Prof. Anthony Harris, A/Prof Beth Kotze and Neil Balnaves AO address the media at Cumberland Hospital today. The unWired Project launches in a period of heightened awareness of how profound mental health issues are in NSW. In this year’s State Budget the NSW Government committed $2.1 billion for mental health services and infrastructure. $42 million for additional community-based mental health services and supports. In addition, the NSW Government announced a $700 million Statewide Mental Health Infrastructure Program to transform existing facilities. If you or someone you know needs crisis support call Lifeline 13 11 14 or Kids Helpline on 1800 55 1800. For local mental health services phone the NSW Mental Health Line on 1800 011 511.